A New Dress for Mona is a play about the young Bahá'í martyr, Mona Mahmudnizhad. Mona was a beautiful and innocent 16 year old, full of life and promise, when, in 1983, she and 9 other women were unjustly executed by authorities in Iran. But Mona was more than a victim of oppression—she faced hatred with love, hardship with perseverance, and death with astonishing courage. Read her story, ponder her example, see if she doesn't change your perspective on the possibilities inherent in humanity. This resource site includes information about Mona's real life as well as the play based on it. You can learn about productions of the play and see photos of them. You may also view photos of Mona, her family, friends and fellow martyrs on this site. Information about her religion, the Bahá'í Faith, and about the subject of martyrdom are also provided along with some related links. The play gets its title from a dream Mona had some months before she went to prison. In the dream, Mona was offered her choice of three garments: one was red, and it symbolized martyrdom; one was black, it meant a life of sadness and suffering; the third was blue, Mona's favorite color—it stood for a life devoted to serving humanity. In her dream, Mona chose the blue. In her life, Mona eventually chose to wear each of them . Shiraz, Iran. 1982. Fanaticism runs rampant in the streets, and Mona, as a Bahá’í – a member of Iran’s largest religious minority – is the fanatic’s prime target. One night, she has an important dream. It is a dream of three dresses, each representing a different direction her life might take. In her dream and in her waking life, Mona makes her choice – a choice that will lead her straight into danger’s path. Based on a true account, this full-length drama raises fundamental and challenging questions about life, faith and sacrifice for all to consider. There are several ways to read more about Mona's life. 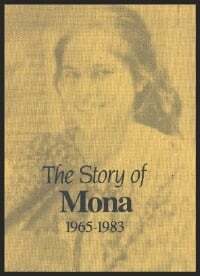 A full biography on Mona is now available. It is called "Our Friend Mona" by Azadeh Rohanian Perry and Mark Perry, published by Circle of Spirit Publications (an imprint of Drama Circle). There are also a number of other accounts available. We are happy to include two on this website: "The Story of Mona: 1965-1983" and "Mona's Life." The Story of Mona: 1965-1983. A fairly detailed account of Mona's life, it also includes short biographies of the other women executed with Mona. Published in Canada, it accompanied the release of the song & music video, "Mona with the Children" by Doug Cameron, which imparted the story to many people. "The Story of Mona" is posted on this site with permission. The copyright is held by Baha'i Canada Publications, under the auspices of the National Spiritual Assembly of the Baha'is of Canada. Mona's Life. This is an effort at compiling Mona's story undertaken by a Baha'i in Iran. This unpublished account has been fully authenticated by Mona's family. It was written with a Baha'i audience in mind, so there are certain expressions or references that may be unfamiliar to a general audience. The English translation is provisional. We have the blessing of having received some photographs of Mona, of her family and friends, and of her home. It's an honor to share them with you. that it can illuminate the whole earth"
The reason Mona was executed was simple: she cared more for her religion than she did for her own physical life. Mona was by no means alone in this. The Bahá'í Faith, since its inception in 1844, has seen thousands of its brightest lights extinguished by the intolerance of fundamentalists. The Bahá'í Faith is not, however, a religion of fatalists, fanatics or cowards. It is a life-affirming Faith with a rich literature and history. Its members are actively concerned with the world they live in and they strive to bring unity to different races, religions and nationalities. For more information about the Baha'i Faith, visit www.bahai.org. The final resting place of Bahá'u'lláh, Prophet-Founder of the Bahá'í Faith at Bahji, near Akka, Israel. Here are some other resources (online, print or other media) about Mona, the persecution of the Bahá'ís of Iran, or the Bahá'í Faith more generally. A book that has done much to publicize the tragic events in Shiraz during the Islamic Revolution is Olya's Story. Olya Roohizadegan was a fellow prisoner with Mona and the other women, but she lived to tell the story. The Bahá'í World is the official historical record of the international Baha'i community and the information and context provided are matchless. The lives of Mona and the other women are presented here in Volume 19 (1983-86).